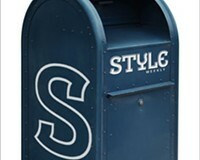 Henricocalypse | News and Features | Style Weekly - Richmond, VA local news, arts, and events. A year rocked by natural disasters sparks a sudden interest in survival for central Virginia. 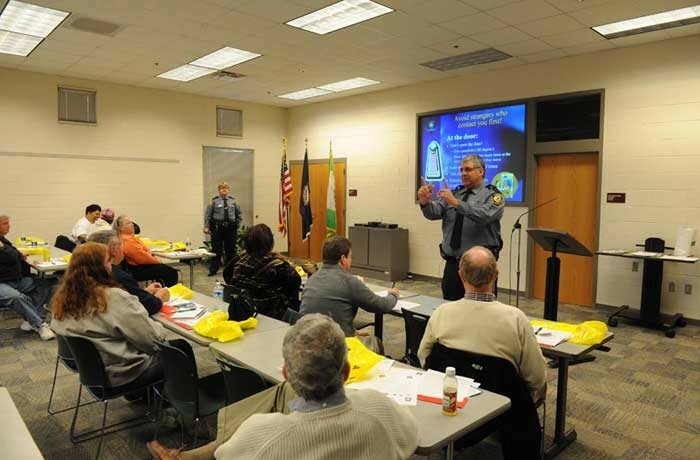 Police officer Larry Belviso covers safety and home security at the Henrico County session of Central Virginia Disaster Survivor Day. Central Virginians have a developed a sudden interest in surviving. It's no surprise, really. In February brush fires swept Henrico, Chesterfield and Louisa counties. In April tornadoes killed five Virginians — the first time in a decade the state saw tornado deaths — then ripped though Louisa and New Kent County in October. August brought Hurricane Irene and a 5.8-magnitude earthquake. The disastrous year drew nearly 1,100 people to regional survival classes for the first-ever Central Virginia Disaster Survivor Day on Jan. 14, which was funded with a federal Homeland Security grant. About 150 people filled the Henrico session to near capacity. Henrico's 911 system fielded 500 calls just after the earthquake — not to report injuries, but to ask what was going on. But the authorities won't always be there to help. Henrico has 587 sworn police officers for a county of 307,000, says Anna M. McRay, Henrico's deputy coordinator of emergency management. That's one officer for every 523 people. There are even fewer sworn firefighters, 527. This means that in an emergency the first person on the scene won't be a trained professional, but an average Henrico resident, McRay says. "I need you to go out and preach the gospel of emergency preparedness," she tells the crowd. They are enthusiastic disciples. They write down the aphorisms shared by National Weather Service meteorologist Bill Sammler: "When thunder roars, go indoors" and, for tornadoes, "go low, stay low." They listen to McRay's cheerful overview of basic first aid: "Red stuff outside the body is a bad thing," she says. "Right?" During a break, they try putting out a digital fire with a mock fire extinguisher. The experts — mostly Henrico police and fire workers — cover a lot of ground: stocking emergency kits, food safety, even identity fraud. But one disaster isn't addressed: terrorism. Why? The topic wasn't left out intentionally, McRay says. "Citizens need to know what to do if we have another terrorism event," she says. "It's not a question of if, it's a question of when." But, she says, "you prepare for a terrorist event the same way you prepare for a hurricane" — by having an emergency plan and supplies. Another word that went unsaid: nuclear disaster. "It's a threat," McRay says. But the impact of an accident at the North Anna Power Station in Louisa County or the Surry Power Station in Surry County would be localized, she says. The Richmond area lies outside the emergency-planning zones that extend in a 10-mile radius around each plant. A meltdown at North Anna, however, could leave much of Central Virginia uninhabitable for thousands of years. There wasn't time in a three-hour session to cover everything, McRay says, but the free, nine-week Community Emergency Response Team volunteer training delves deep into emergency plans for specific disasters. About 25 Henrico residents signed up for the team after Survivor Day. Glynis Boyd Hughes, a Glen Allen resident, brought her 9-year-old grandson, Que Boyd, to learn what to do in case of hurricane or earthquake. "My grandson, he really gets anxious about things like that," Hughes says. Or less catastrophic events — such as the time Que put aluminum foil inside the microwave and it caught fire. Que takes careful notes: "Emergency numbers. Make a kit for our houses. Have a list of contacts." "If you feel prepared," his grandmother says, "even when it happens it's not so bad." But what if 2012 turns out to be worse than 2011? "Right now, in Henrico County, there's a volcano forming," police officer Larry Belviso tells the Survivor Day crowd.